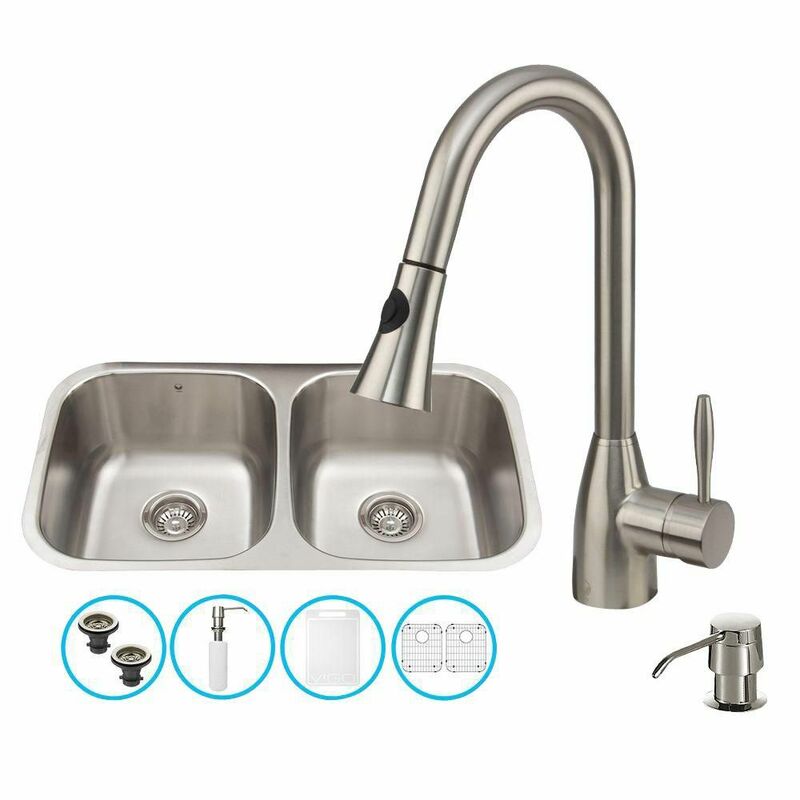 Stainless Steel All in One Undermount Kitchen Sink and Faucet Set 32 Inch is rated 4.0 out of 5 by 7. Rated 1 out of 5 by Flanagal from Worse sink ever. Good that its been discontinue. Sprayer constantly breaks. Can 't find match... Worse sink ever. Good that its been discontinue. Sprayer constantly breaks. Can 't find matching replacements for the sink stoppers. After one year - I'm replacing. Rated 4 out of 5 by VLewis from Exceeded Expectations Excellent finish and workmanship. Was very pleased that all the internal components were brass and not plastic. Installation was simple, all the components you need are included. The sprayer head retracts by a weight on the line versus a spring so when we pull the sprayer out, the weight clunks against the back of the cabinet. Also, the sprayer head is difficult to lock back into place so we have to leave it out about a 1/4". Overall, a very nice all-in-one set for the price. Rated 5 out of 5 by csoup from Redesigned model I bought this product three years ago and love it. Recently the nozzle needed replaced. Vigo tech support was extremely easy to deal with and provided a much improved replacement part. Thank you for such a fantastic product and service to match! Rated 5 out of 5 by goose from Beautiful design Love, love, love the design of this faucet...it makes the whole look of my DYI kitchen make over that much better. Rated 4 out of 5 by angel from beautiful!! such a good combo deal for the price and what a great sink!! Rated 5 out of 5 by Kay251 from Solid product I have only had in for about a month. The product is beautiful and seems to be solid. I have professional installed it so i cant comment on installation. Rated 4 out of 5 by walkann from Wonderful product - packed really well Just had the sink installed - faucet gets hooked up tomorrow. Only problem with the faucet is that our "really high" backsplash will interfere with the operation of the faucet. Will have to see what the plumber says tomorrow when he finishes hooking it up.